God has been teaching me a powerful lesson of late. I knew it and believed it, but I wanted to be super nice and give everyone all the chances that I could. Then God told me something loud and clear. "Stop." There are people who are being used to work against the kingdom of God. For us to not believe this, would be for us to say the Bible is not true and spiritual warfare is not real. Over a period of several months, I kept getting the same message over and over. Beware of the false prophet. Immediately after listening to a podcast from one preacher, I walked into my parents ranch house and saw that a man had shot many soldiers at Fort Hood (a few miles away). That man was a member of the military himself. There was another clear message. The shooter was a clear depiction of a false prophet. He walked among them. He spoke their language and wore their clothing, but given the chance he opened deadly fire upon them. 1 Peter 5:8 tells us that the enemy walks around like a lion looking for someone to devour. A zoologist will tell you one of the top places a lion waits to attack his prey is at the watering hole. In the body of Christ, where do you think this watering hole is located? The church. One friend said he thought that about 75% of the church would fall under the realm of false prophet. High number. Barna research says 60% of the Christian church does not believe Jesus is who He says He is. 60 %. Pastors included. 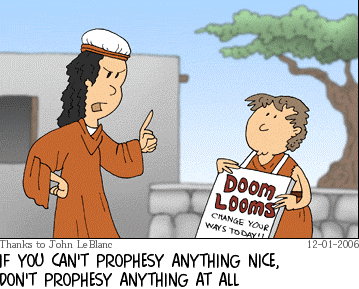 How can you tell if someone is a false prophet? "The devil is a better theologian than any of us and is a devil still." Good post, and so true. Thats why we need to stay in God's word everyday, but still we need to remember, he is a great deceiver and a lair, and the father of it, and I'm speaking of satan. One way we can tell is having a love for the brethren, a real love.